Framed photo of a sculpture by John Martin Gilbert. Gilbert was an illustrator and scultper active in the 1960s ad 1970s. "The Politician" is Gilbert's vision of the inner workings of American politicians. The poster is held under glass by a thin silver frame. 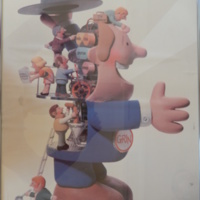 A framed poster depicting "The Politician," a sculpture by John Martin Gilbert. “"The Politician" Poster,” UIS History Harvest, accessed April 25, 2019, http://uishistharv1.uis.edu/items/show/98.